There is no right or wrong way to homeschool your children. Some families like to do ‘school at home’ which very much replicates a classroom environment, while some are at the other end of the spectrum and ‘unschool’ their children. And then of course there is so much in between. If you are new to homeschooling or are considering homeschooling for your family, getting started can be very overwhelming – between the laws and regulations, to all the curriculum choices out there, it can be quite daunting. And then there are several different methods of homeschooling to consider and figure out which one (or a combination of some) would be best for your family. Below is a quick guide to get you started with trying to figure out the best homeschooling method(s) for your family. These are experienced homeschoolers and bloggers that have shared a little bit about the method they use and why it is a good fit for their family. This is NOT an exhaustive list; these are just some of the more popular homeschooling methods. Let’s briefly and quickly talk about classical education, shall we? Classical education is simply a model of education which focuses on the big picture of learning, learning how to learn, as well as loving learning. The most common understanding of the classical model is learning how to learn through the Trivium, which basically represents three paths of learning. There’s more to classical education than the Trivium, but for the sake of simplicity we’ll stick with the basics of the Trivium. In a nutshell, anyone of us can learn anything, at any stage of life through the process of three stages: grammar, dialectic, and rhetoric. The first stage focuses on memorizing important information of each subject matter (grammar stage). The next stage focuses on understanding that information by asking the questions how and why (dialectic stage). The third stage focuses on creating our own ideas of each subject matter, applying those ideas, and then teaching them to others (rhetoric). This stage is more about understanding ideas so well, that we can come along side someone else to help them understand the material to the best of their ability. Therefore, we memorize so that later we can talk about it, then later we can formulate our own ideas about the material. To be frank with you, I don’t think I could homeschool without the classical model. This model has helped me keep our schooling effective, efficient, and is teaching me how to love learning. Over the years I have discovered how to throw off all that hinders our education, without losing effective education. I am seeing my children make connections that I never thought possible, retain information over long periods of time, and yet still have plenty of time for living life. This model helps me prioritize what’s most important, as well as helping me teach my children to think for themselves. Basically this model helps me, the teacher. My primary resource I use to educate my children is Classical Conversations, which is a community of people working together for the same goal. Not only has this program helped me have a better understanding of the classical model, but also walked with me in helping me become the best teacher for my children. I also use Saxon math for our math curriculum, Ordinary Parents Guide to Teaching Reading to teach my children to read, as well as IEW’s Teaching Writing: Structure and Style, which Classical Conversations uses for older elementary students. My favorite resource in using the classical model is Classical Conversations Writer’s Circle, which features articles in using this model practically. For more details on the classical model, check out my post: Classical Christian Education Explained Simply. One of the most common questions I hear is, “What is delight-directed learning?” The simple answer to that question is “teaching your students according to their interests and passions.” But that answer always begs a few more questions. That’s why I wrote a series on my blog, Ben and Me, last year — 31 Days of Delight-directed Learning. Delight-directed learning has been a way of life for us for many years now. It began when my son was in 2nd grade and already losing a love for learning. I didn’t go all out in the beginning and just change everything we were doing all at once, but instead took a slower approach. Then one day it finally hit me — this method was working for him. He didn’t complain about being bored, and most days he was excited about what was next. Well, except for math. He’s never been excited one day in his life about math. But he was excited about learning. And he was taking ownership, even at that young age, for his homeschool days. I believe with all of my heart, that giving our children the tools to learn about those things in which they are most interested, passionate about, and bring them joy and delight, will also give them the tools to a lifelong love of learning. I have seen it happen time and time again. Whether you are a unit study-loving family, or one that prefers a boxed curriculum approach to homeschooling, I want to encourage you give delight-directed learning a try. How that might look is up to you. Perhaps you can set aside one day a week or one week a month. Maybe a fun summer or Christmas-break study is more your style. We use this method for almost all of our homeschool days, but I understand that it’s not a method everyone is comfortable using exclusively. 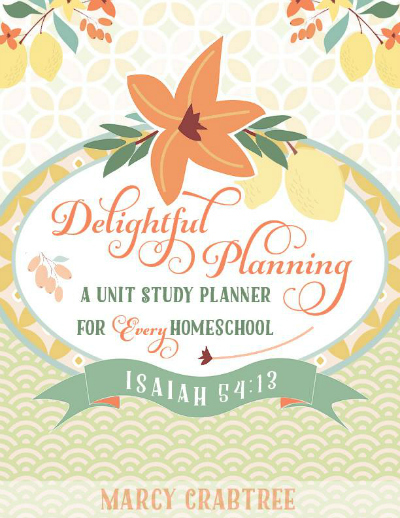 My hope is that you will grow to understand that a delight-directed approach can be used in every homeschool, no matter the homeschool method you generally prefer. You can follow the interests and passions of your students at least some of the time, creating a more delightful homeschool. If you’d like to learn more about how to incorporate delight-directed learning into YOUR homeschool, I wrote an ebook that gives you step-by-step instructions and includes planning and journaling pages. 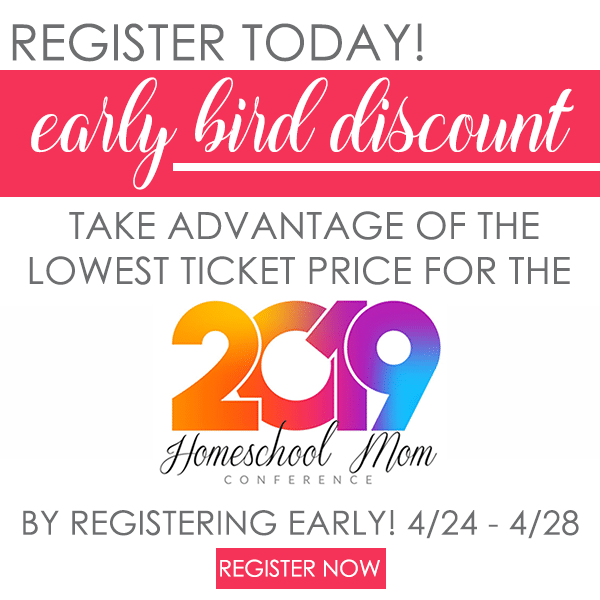 An Eclectic method of homeschooling is basically pulling bits and pieces of several different homeschool philosophies, styles, & curriculum to create the best educational plan for your children. Eclectic Homeschooling is extremely flexible for planning and is easily worked around your homeschool budget. We have tried a few different methods of homeschooling in our 11 years of homeschooling, “school at home” to strictly online to unschooling to Charlotte Mason to Unit Studies, each one with their pros and cons for our family. I have pulled the pros out of each method to create an eclectic curriculum that works best for us. We have a classroom (school at home), we use online programs for math and learning to read, the boys can choose topics that interest them or have days of unschooling, we include lots of Nature Study and Living Books (Charlotte Mason), and I typically tie all of our subjects together in a Unit Study style with lots of Hands-On activities as well as worksheets & other printables. 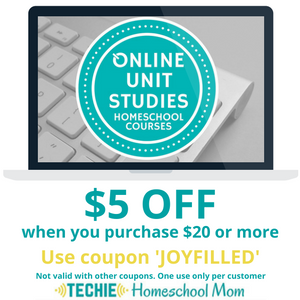 A new favorite online, unit study program that we are enjoying is from Techie Homeschool Mom. I’m not sure if we fit into the common definition of unschooling, if there is one. Years ago, unschooling meant you used NO curricula whatsoever, and many folks I new who were proud self-described unschoolers had no discernible or definable process, either. Our family came to this method in a very circuitous way. When we began homeschooling, we had two pre-schoolers and lived overseas. Immersed in the culture, our learning consisted of cross-cultural experiences and language studies. Returning home with 2 elementary-aged children, we fell into the mold of school-at-home, and began moving through more traditional methods. As our kids got older, however, our approaches and attitudes matured, too. Today, our unschooling is a combination of unit studies (where the kids dig deep into a particular topic/interest using a variety of sources), small-group co-op classes (which often use teacher-created materials, but might sometimes use a textbook as a resource), and real-life learning (based on activities such as volunteering, Scouting programs, crafting classes, and such). While this approach might also be described as eclectic, we describe it as unschooling due to its emphasis on developing a lifestyle of learning, as opposed to a more structured process. You can read more about the tools and methods we use over at our blog, PatAndCandy, and get access to many of the helps we share with our readers when you subscribe to our periodic newsletter. Real homeschooling is keeping the family together, engaged and excited about learning from the youngest to the oldest child and the best way to do this is with unit studies. A unit approach focuses on one central topic. Once this topic is selected all learning revolves around this subject with reading, vocabulary, language arts, science, history, geography, art and even music incorporated in the study. This means no more isolated textbooks in each subject. Unit studies encourage families to study, discuss, research and create a learning environment that is more natural. Therefore, there is a greater retention of information and more success. For us, unit studies were by far a favorite and helped my learning challenged son not only succeed, but excel. He and his sister were able to learn together. I could teach a specific topic and then have them create hands-on projects and use experiments to further explain an idea, all in a fun-filled approach. Even with age gap differences my subsequent three, younger children were able to participate. The approach to learning worked great. For example, we could all learn about oceans but on different levels. A trip to the beach to collect specimens included all the children. The younger ones could collect and categorize while the older children could write papers and perform experiments dealing with the salinity of water. If we were using textbooks the experience would not be the same. I highly recommend the unit study approach no matter what your child’s ages. Felice Gerwitz has homeschooled since 1986 and has five children. She podcasts at Vintage Homeschool Moms and enjoys mentoring moms. She is the author of numerous books and her curriculum was selected in Cathy Duffy’s 100 and 101 Top Curriculum Picks. The Charlotte Mason method is named for its founder, an educator dedicated to breathing life into the predominantly utilitarian schooling methods she saw around her in Victorian England. At its very basic, a CM approach asserts that a child is a person and that the function of education is to address the whole person, not just his mind. The hallmarks of this homeschooling method are using living (ie, “real”) books in lieu of textbooks, short lessons, the practice of narration, and nature study and the keeping of nature journals. In our home, we embrace the words of Miss Mason: “Education is an Atmosphere, a Discipline, a Life.” While specific CM curriculum definitely exists, the heart of this approach lies less in following a specific checklist than in cultivating an environment where your family explores great ideas via literature, art, nature, and creative expression. Charlotte Mason has set us free to live and learn together as a family, instead of in prescribed boxes! On a day to day basis, this might look like my family gathered together in our living room, listening to the next chapter in a classic book, or sitting ‘round our dining room table singing a timeless hymn, or all of us making detailed sketches of our newest bird sightings, or even a gentle study of English grammar… combined with a constant care to develop good habits and appetites. Pursuing a living education lifestyle has allowed my children to thrive academically, yes. But it’s also fostered a true spirit of autodidacticism that has knit us together with a beautiful family culture built on a shared love of exploring God’s world. Charlotte Mason wrote a 6 volume treatise on home education, which is available for purchase, or free online. Other beloved volumes distill her philosophies into more modern language and practical tips. Among the many titles available, the most often recommended are For the Children’s Sake by Susan Schaeffer Macaulay, A Charlotte Mason Education by Catherine Levison, and A Charlotte Mason Companion by Karen Andrea. The internet is full of wonderful Charlotte Mason resources as well. Simply Charlotte Mason offers encouragement and fellowship via forums, a completely free curriculum plan is available via Ambleside Online, and, while not specifically CM, Read Aloud Revival has excellent living book lists and tips on how to become a family that learns together. Heather is the wife of one globe-trotting, church-planting adventurer, and Momma to 9 beautifully messy children who range from infant to adult. She writes about parenting, homeschooling, special needs, adoption, and serving a very big God through the mundane stuff of life on the family’s blog, To Sow a Seed. Today I am going to share a little about Montessori and how we use it as part of our homeschooling day. Montessori is ultimately about observation. Maria Montessori was a doctor and scientist that developed her philosophy after many years of research. She believed that children develop and learn differently throughout life and breaks it down into 4 planes of development. Starting with Birth-6, second 6-12, third 12-18, and fourth 18-24. There is a defined scope and sequence of lessons that are offered at each plane of development and a self-sufficient adult is the ultimate goal. You might love everything about Montessori and want to use all of the materials or you may choose to just add in parts of Montessori (like we do) to your everyday life. We love the practical life aspect of Montessori. Having your children help with baking, food prep, dressing themselves and other daily self care are important. It will help them gain confidence and experience for their future. In the first plane (age 0-6) The goal for teaching your children is to go as wide as possible, exposing children to vast amounts of language and sensory experiences. I really like this idea because it gives them general knowledge of a variety of different topics. As they get older they can dive deeper into specifics of a topic of interest. Montessori materials are designed to be used in a specific manner and at a specific point in development, but don’t think you have to have these materials to adapt Montessori into your life. Like anything you can use parts of Montessori or DIY your own materials. After doing a little reading on the Montessori philosophy you might realize that you already incorporate Montessori into your homeschool life. I hope you enjoyed this introduction to Montessori. I’d love for you to visit me at Natural Beach Living for more homeschooling activities and ideas. If these ideas resonate with you, I encourage you to read a few introductory books and see if Montessori is something you want to go deeper with. Susan Mayclin Stephenson has two books that offer a solid overview. The Joyful Child is for ages 0-3 while Child of the World is for ages 3-12. I also recommend The Absorbent Mind by Maria Montessori. I looked over MANY curricula before we started homeschooling. It’s overwhelming to say the least. Our first year I used a little of everything. Reading from one company, parts of two different language arts programs, Bible lessons from whatever devotional I picked off the shelf that day, history units I pieced together myself… we had fun, but it was really exhausting to do it that way. And I always felt like we were “switching gears” between subjects. Nothing flowed. And I usually lost my son’s attention during these moments when I was trying to go from one stack of materials to another. Then I found Sonlight. Sonlight is what you would call an “all-in-one” or “boxed” curriculum. What makes it different from, say, Bob Jones or Abeka that offer all subjects? Well, a curriculum like Abeka is still “in pieces”. Each subject has it’s own guide, text, workbooks, etc. Sonlight takes multiple subjects and meshes them together and gives you one guide to follow for those subjects. Sonlight’s “Cores” or what they are now calling “HBL” is History, Bible and Literature. And then they have “Language Arts” or “LA” packages that are reading/phonics, language arts/writing and spelling. With the Core I get one guide, with one page per week, that breaks down what we do in those subjects. And the same for the Language Arts. One guide, one page per week, that breaks down what we do for those subjects. AND in the LA, the language arts lessons come from passages in the books for the reading portion! That’s so much better than having to have a whole stack of books, guides, workbooks for reading AND a whole stack of books, guides and workbooks for language! Sonlight using real books – there is no history “textbook”. Your history comes from one or two source books (sometimes called the “spine” of the program) plus a few extra books. And then the Literature portion if FULL of great books to be read! So you’re buying a lot of books – but they are REAL books, not textbooks! A lot of people get sticker shock when they see Sonlight’s prices. But I have found it beneficial to buy the Core and LA guides second hand from buy/sell/trade groups (just search “sonlight” on Facebook to find a group!). I get a lot of the books that way too but if I can’t find the ones I’m looking for from a seller, I know just where to turn. There are two great used book sites that I LOVE to shop from! They are Better World Books and Thrift Books! If you love books, you need to check out both those sites! Better World Books ALWAYS ship free and most are under $6. They have sales and specials all the time too – I’ve gotten books for $3 or less on numerous occasions! Thrift Books‘ prices start at $3 per book and they offer free shipping on orders of $10 or more. But before I buy any books for the year, I check our library. If the library has the book, I don’t buy it! These tips combined have allowed us to use a $500 curriculum for under $200/year! Now that we use this “boxed” curriculum, I can grab my LA guide, our current book and a dry erase lapboard and we can get comfy on the couch for reading, language and spelling lessons with a nice flow! And the same for our Core. All I need is the guide page for that week and our books and we can get history, Bible and literature done! We’ve even grabbed our books before and gone to the park with them! And we’ve schooled on trips! When all you need is your guide for that week and a handful of books small books (no bulky, “year-long” textbooks), it’s very portable! This type of curriculum has been very good for us! 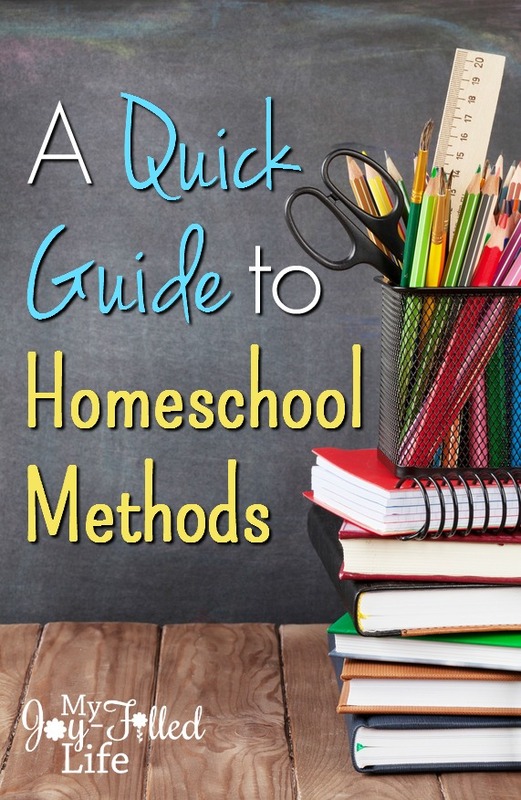 Hopefully this quick guide will help you as you begin your homeschool journey, or if you are already a homeschooler who is looking to make some changes. What homeschool method do you use or lean toward? It’s that time of year – the time of year when many homeschool families are making important decision on which curriculum and resources to use for the upcoming school year. Homeschooling can get expensive, and sometimes we aren’t able to get everything on our wishlist for the year, and some years we might be so stretched for cash that we aren’t able to buy much for our homeschool at all. 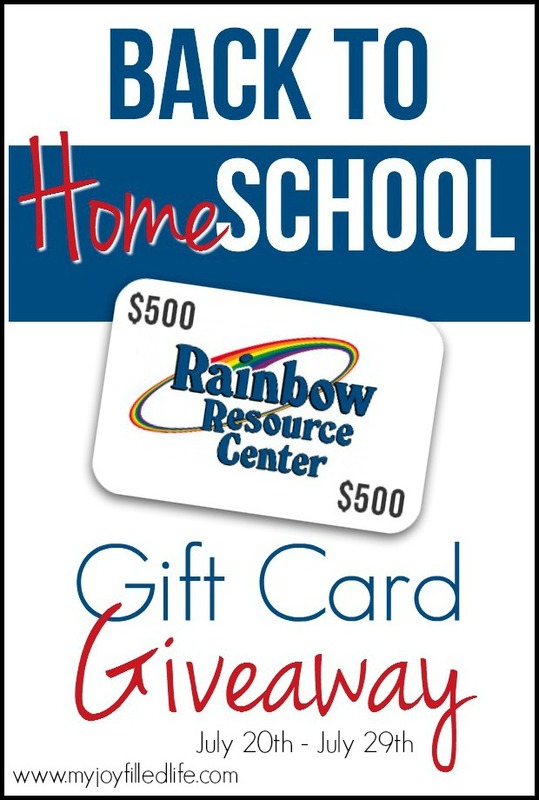 I’ve gotten together with a group of other bloggers to bring our readers a HUGE homeschool giveaway – a $500 gift card to Rainbow Resource Center! We know homeschooling can put financial strain on families – whether it’s from living on one-income or buying curriculum for multiple children – the financial aspect of it can be stressful. Our hope is that we can bless a homeschool family this year by allowing them to get all (or most) of the goodies on their homeschool wishlist – and that could be your family! Giveaway ends July 29th, 2016 at 11:59pm EDT. Must be at least 18 years of age and a U.S. resident to win. Selected winner will have 48 hours to respond to email notification to claim their prize or another winner will be drawn. Thanks for making learning about homeschool easy! There are so many thing but I would by Beyond Five in a Row volumes 2 & 3, some board games, Saxon math 5/6, Saxon Geometry, and Notgrass World History to name a few of the things. What an amazing opportunity. Thank you. We recently moved and I have not had the time or money to even think about what we need for this coming school year. If I won, I would buy some science and history curriculum along with some other odds and ends. I always keep a wishlist with rainbowresource throughout the year and then I review each item before making a final decision in the summer time on my purchases. Right now my wishlist is hitting close to a thousand dollars. So if I win this giftcard, I will probably buy my whole wishlist for my three girls (grade 8, 4 and 1). That would be fantastic! I would buy science and history curriculums with this and books for our reading library. I would buy the Bible,science, geography, reading and writing curriculum and school supplies that have been sitting in my wishlist for months. 🙂 Cant wait to do the Science in the Beginning activities with my 2, 5 and 6 year old! I would be able to buy the curriculum that I really want if I wo the money. So many things that want but never seem to have enough money. I would buy some progeny press study guides and math manipulatives! I have many items I would buy, but I would start with our math and history needs for the upcoming year. A variety of things. Some Queen Homeschool materials, science materials. Would be so exciting to “shop”! Oh boy.. I would buy everything I have been drooling over forever!!! I would buy so many things! We would go sticker crazy and get some preschool curriculum. I would buy primarily Science items for my three high school students. I would buy some courses for my teenage daughter and maybe a few games for the family. Thanks for the wonderful giveaway! I LOVE Rainbow Resource Center and am never at a loss for things to get from my wishlist. If I won I would us the gift card to purchase one of the high $ things on my list that I have been drooling over, but have never been able to justify spending the money. I honestly would probably buy a few books and give some credit to another homeschooling mom friend of mine who is facing tougher times than I.
I would buy a several Life of Fred books and some science materials. Health Quest LIFEPAC box set, Bible curriculum, Math Manipulatives, Spelling, Writing, and supplies are some of the things we would get. I would buy the Math and Spelling books we need since we are close to finishing our current books. There are always great reads on my wishlist. And I am interested in classical music appreciation items. Wow I would buy math stuff, and science, then lots of fun stuff! I would buy my youngest sons math books, timeline figures from homeschool in the woods, and some queen homeschool. I would also invest in iew curriculum or teaching textbooks. I would buy a variety of school books, crafts and games for homeschooling my daughter, and books for her to read. Thanks for the giveaway opportunity! Oh wow! A gift card to Rainbow Resources would be a HUGE blessing! I constantly have a wish list going filled with items for our six kiddos. I’d purchase tons of excellent literature! I would buy a few Life of Fred Elementary series. Since we are a literature loving family, I’d definitely have to get books, books, and books! I need General Science! So many things!! The first thing I would buy would be All About Spelling and All About Reading. I would lean it out over several months to be able to spend some online and the rest at convention. Probly for the speedy maths and sciences but lots of fun stuff too. What can’t you buy from Rainbow Resource!!!!! I would buy curriculum, supplies, building blocks, and art supplies!!!!!! If I won the Giveaway, I would buy hands-on materials for my son and college prep materials for my daughter. Thank you so much for the opportunity to win such a valuable prize! We still need curriculum and funds have been tight so this would be a blessing! Thanks for offering this generous giveaway. If I were to win, I’d purchase high school science materials. If we won this giveaway, then I would use the money to help me purchase the following for the new year: Memoria Press Literature Fourth Grade Package, IEW Phonetic Zoo’s Level C (CD’s only), Rummy Roots, Science in the Beginning Set, Life of Fred Math, and Bible Study Guide for All Ages. I can’t decide on which American History curriculum I will use yet but I would purchase either All America History Volume 1 set, Notgrass America the Beautiful, Beautiful Feet Early American History, or Adventures in America. I am also considering Uncle Sam and You for Civics. Thank you for the opportunity to win this giveaway. This giveaway is A-MA-Zing!! I don’t know what specifically I would purchase, but I have their new catalog and wouldn’t have any trouble spending the money. I’m a big fan of Rainbow Resources since I met them in March at convention. I would buy Singapore math, various history books, and music masters CDs to finish off what I still need for school. This would allow me go get more hands on material and learning games. If I won this give away I would use it to buy Singapore math and other items I need for heart of Dakota. This is great! I would purchase some science “extras” for my boys along with some sensory supports for some of my kids that could benefit. Thank you! This would help out so much. I love everything from Rainbow Resource!!! I’d buy next year’s curriculum. I’m sure that there would be so many things I would want but first off, definitely our Reading and Spelling material (AAR/AAS). My little one is a baby at the moment, so I would buy preschool and kindergarten age things to help us start off! I would start with All About Reading. With kindergarten-Senior, I would really have to focus beyomd that. I would start with All About Reading. With kindergarten-Senior, I would really have to focus to decide after that. Thank you for this thorough list of resources and outlines of so many methods! My DD is two, and we are starting to gently work on some letter recognition/phonics, and of course in our daily life we encounter other subjects (though we did a thorough butterfly life cycle unit when we ordered live caterpillars and raised them at home). This sounds like an amazing blessing. It would cover us for an entire year and allow us to continue to homeschool. So I would use it for our main curriculum. I would buy several things. High school government and economics, literature, and books to read. Several resources for a chemistry of food course. What a great opportunity! I would buy all the things we are lacking. What would I buy?! There is so much I wold love! It would probably be some workbooks to help my youngers with math and handwriting. This is an amazing giveaway! I would definitely purchase a Greek curriculum if I had extra $$ to spend. My oldest wants to learn Greek, but I’m just not sure it’s in the budget for this fall. If I won, I would pass the gift card on to my aunt, who is homeschooling my two younger cousins. I’m now in a PhD program, and my own parents’ homeschooling (and a lot of Rainbow Resource books!) were largely responsible for getting me here. I’d love to help my little cousins have the same kind of nurturing academic experience! Thanks so much for this opportunity to win! What a blessing! We just finished our first year of homeschooling and there are SO many things I would like to purchase for the future. Apologia’s Exploring Creation textbooks, Life of Fred, Story of the World, and the Drive Thru History DVDs, to name a few. I would buy science, math, and history resources. My child learns better with more hands-on activities, so the more manipulatives the better! I’d probably buy some board games and math curriculum. If I win I will see what my daughter has on her wish list for her 3 children. I know she needs more Saxon math and curriculum for older grades. First thing I would buy would be history curriculum, and kindergarten items. We are just starting our homeschool journey. My first purchase would have to be my daughters kindergarten curriculum and supplies. I’d buy supplies for our school and also supplies to donate to our church kids’ room. I would buy the rest of my son’s math program for next year, books for history, art supplies, and some of the fun things that don’t make the monetary cut. Thank you for this awesome giveaway. This would really help my homeschool budget this year. I honestly don’t know what I’d buy yet. Maybe something to do with geography. And art supplies. This would be so completely amazing. I would get some science supplies, some art stuff, some books, some music…gosh, the possibilities seem endless. If I won, I would by curriculum! Rainbow Resource has so many goodies! I would buy my daughter and son curriculum for the next few year! We love Rainbow Resource! I would buy the bible curriculum, spelling, and a few other things. I am eclectic in nature and would be very very happy to collect various curriculum to test out that I would otherwise be unable to afford. My children both have special needs. I would buy books that I could use to help them to learn how to love learning. Oh my, if I was to win this, I would buy Kumon preschool books for my littles, a dvd art curriculum, Mystery of History audio cds, Life of Fred math, and the list goes on! Thank you to each of you who have contributed to this giveaway! I would buy our spelling and handwriting curriculums, and lots of hands-on manipulatives and extra hands-on learning things! I would buy some manipulatives for math and some of our books that we use during the school year. I homeschool four boys ages 9 and under. Two of my boys are special needs. Like many homeschooling families we are on an extremely tight budget. Winning this would be beyond a blessing for our family as I’m sure it would be for many others. We would use it to purchase educational materials for this year for the boys which we are trying right now to figure out how to do financially. I love Rainbow Resource!! I have my eye on America the Beautiful History curriculum, and maybe Teaching Textbooks Math!!! I really enjoy Charlotte Mason material…and can’t wait to use some of those resources this year. I would buy reading literature sets, spelling, and math for sure. But Rainbow has so many great resources that I may splurge on something that I wouldn’t usually purchase. I would help my daughter with books for my granddaughters. I would buy history things, the extras that make learning fun. I would buy everything that is on my wishlist AND finally be able to get the EXRTA and just for fun things I longingly peruse while on their site! I would buy the essentials math and English!! I would buy curriculum, books, and hands on stuff. Hope to win. If I were to win the Rainbow Resources gift card, I would buy some still needed materials for this year (All About Reading 4, Story of the World 3 hardcover text), a few supplementary materials we would love to get if we could (History Through the Ages Timeline CD, Life of Fred, Big Book of History), and if I had any left I would stock up for future years and/or purchase other things saved on my wishlist, as we will be moving overseas soon to Chile to serve as missionaries! Rainbow resource has SO many great products! I would buy BJU reading 3 workbook, Bible curriculum, IEW Medieval history writing, spelling power notebooks and activity cards and first grade math. This is awesome! Rainbow Resource has everything! I’d get some map puzzles, lots of books, and our math and writing curriculums! 🙂 So awesome! I would be able to probably buy some “fun stuff” that we otherwise have to pass on as well as some books to continue to build our homeschool library. We are a new homeschooling family! We are very excited to start this new journey and can’t wait to get all for the supplies we need. I would buy historical literature, math and reading manipulative accessories, and beef up our art and music supplies! I would buy something to help with spelling & possibly a foreign language curriculum. I would fill the small gaps in my curriculum and buy my (single mom of 3) best friend’s wish list! Great ideas in this article, very helpful. What an awesome blessing! I would by English, history, supplements and games. There are so many awesome things at Rainbow Resource! It would sure be fun to win and be able to get things that I might not have otherwise bought. Wow! What an awesome giveaway! This would cover my 6 kids’ curriculum for at least a couple of years, since I like to shop sales! Wow! $500 to Rainbow Resource??? I’d be like a kid in a candy shop! I have SO MANY things on my wishlist at Rainbow Resource I’d have no problem going shopping!! The Christmas list is even in there. But, seriously, finances are tight, 1 in college, 2 in high school, 1 middle school, and 2 elem school . . . . it adds up WAAAYYYY to quickly. Everything! Mostly Science for the next few years as that seems to be our most expensive subject. I keep a wish list on Rainbow Resource and it is soooo long. For starters, I’d get a full German curriculum for my high school son, plus French and Spanish for our whole family. I could start buying curriculum for my next year preschooler, like The Ordinary Parent’s Guide to Teaching Reading and Bob’s Books. I’d like to buy ED Hirsch’s “What Your ___ Grader Needs to Know” series and “Books to Build On” as well, I’ve checked them out of the library but I’d really like to own them all. Wow! Thank you for this offer! So many could benefit from winning. If we won, I would use it to purchase additional resources I’d love to have in our curriculum. Thank you again. I would buy curriculum for 9 of my children! If I won $500 to spend at RainbowResource.com, I would split the money between the kids still left at home and maybe even buy myself something, focusing on “enrichment” activities, I think. I would probably buy some math and handwriting curriculum. Thank you for the chance, This is an awesome giveaway. Can’t even think about what I might buy, because then I’d want to go buy it! I have such a long list of things I need for this year, but a few things I would purchase would be a year’s worth of readers for each of my 5 kiddos, Horizons Health, Spanish curriculum for my 9th grader! Those are at the top of the list! Gosh that would be a huge blessing. I’d start by getting the rest of the books we’ll need for this year, like the Singapore Math workbooks, freshen up our ancient history book collection for the little ones, some high school biology resources, the next level of our Spanish curriculum, Lit Lessons from Lord of the Rings, a SAT prep book, and if there were anything left I’d try anticipating what we may need for next year. I would buy the rest of what is needed for school and perhaps a few Christmas/birthday presents! Would get an art curriculum, Our singapore math books for this year, a curriculum to help my oldest with composition and cursive, and anything else I could find for my boys. I would buy Memorial Press curriculum and lots of supplies for science experiments. If I win, my family would be super blessed, and I would order school books from Rainbow. Pretty much everything that I can find there that heart of Dakota uses. Life of Fred math, some science, some educational games, chapter books, & some BFIAR or FIAR manuals to bless new homeschooling families! If I were to win, first I would be shocked and probably cry! I would spend time picking through the catalog and choose things that my kiddos need. What a joy to even consider the possibilities. If I won I would buy an art curriculum and supplies. I would also buy a Reading program for my boys that they need desperately.